These cabinet curtains are wonderful. They are just what I was looking for and make my kitchen. Can't say enough good about them. They hang perfectly and look great. Arrived much sooner than promised. Design placement may vary as to what is shown in shop photos as each piece is individually hand cut at time of order. an 18 x 18 inch pillow cover will fit your 18 x 18 inch insert just right, a larger insert is recommended for a tighter fuller fit! Luxurious feather down pillow inserts are shown in my pic's. Eco Friendly Pillow Covers are zipper-less, have generous envelope back, may be reversible and seams are double stitched with overlocked edges to prevent fraying. Please allow 1 to 2 weeks for larger orders! Curtains, Drapes, Pillow Covers, Tablecloths and Lounge Pants are custom cut to order and once the cutting process begins are considered a work in progress, in most cases only slight changes can be made. 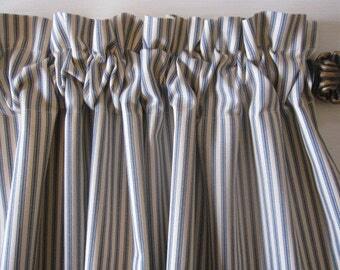 Curtains ordered wider than 50 inches and Horizontal Striped Curtains are subject to a seam and or seams. Vintage Chic Furnishings are one-of-a-kind! Thank you for stopping by Cottage Home Couture. An Order Can Not Be Cancelled Once I Have Begun The Process Of Cutting And Sewing...ALL CUSTOM MADE ITEMS AND FURNITURE PURCHASES ARE FINAL SALES AND NON REFUNDABLE. Shippings costs are always the buyers responsibility. I accept Etsy and Pay Pal and payment is expected upon purchase. Furniture is available for Pick-Up Only. Shipping is always thru the USPS. I weigh everything very carefully taking into consideration all packaging to insure there is no damage when you receive your item. Insurance is not included and should be taken out if you have any doubt, please let me know that you have purchased insurance with a message in the comment section. I will in some cases purchase Insurance on Larger Orders when the amount of Insurance provided by USPS is not enough to cover the cost of the item/items you have purchased. responsibility to pay any difference in the new shipping rate and insurance before that item can be shipped. Thank You for Shopping with Cottage Home Couture!